This leaf with its many shade﻿s of green and brown is only produced in the Taiwanese highlands. Stopping the fermentation process at the right moment leaves only the edges fermented, whereas the leaf centre remains green. This quality has a fleshier and more finely processed leaf than standard Oolongs. The cup shines a brassy color. The infusion shows the blaze of color with the differences between intense green and brown colors. 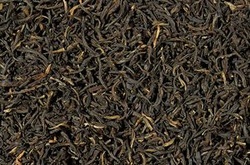 The tea has a slight black tea character with a pleasant sweetness and a slightly doughy note.